Retirement income mutual funds are popular among retiree and near retirement age investor. These funds can provide regular income for investors. The funds’ portfolios usually consist of a mix of stocks, bonds and cash for those investors already in or entering retirement. These funds tend to have a conservative asset allocation strategy. These fund portfolios objective is to provide investors with steady income throughout retirement. The following are the Top Performer Retirement Income Funds. The top performer funds are sorted based on its Year to Date performance. 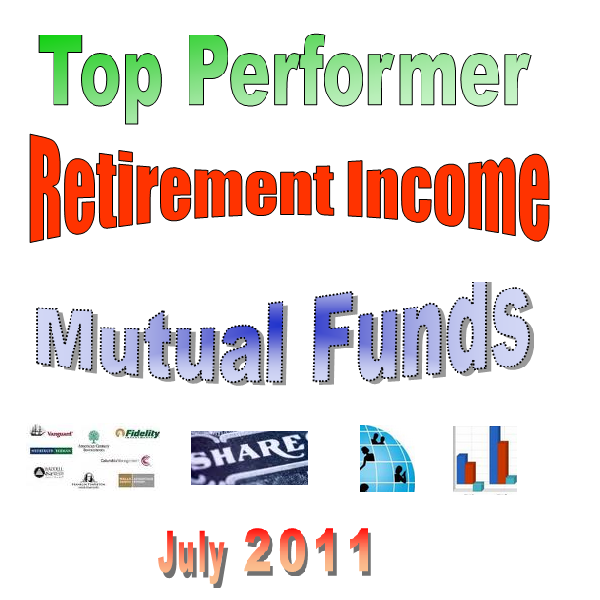 New: Top Performer Target Date Mutual Funds of 2011. 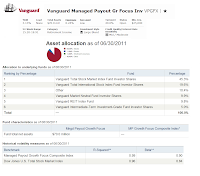 The Vanguard Managed Payout Growth Focus fund objective is to provide monthly distributions of cash while providing inflation protection and capital appreciation over the long term. This Vanguard fund invests in Vanguard mutual funds and other investments according to an asset allocation strategy designed to provide shareholders with regular cash flow from their investments in the fund. 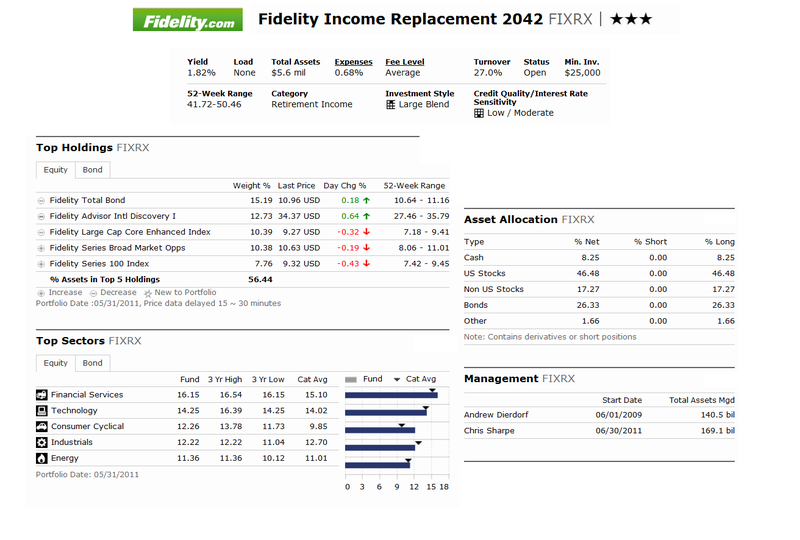 This mutual fund may allocate assets across a broadly diversified selection of opportunities--such as stocks (including stocks issued by REITs), bonds, cash, inflation-linked investments, and selected other investments--in proportions that reflect the advisor's evaluation of their expected returns and risks as an integrated whole. This retirement income fund is managed by Michael H. Buek since its inception on May 2008. Since this fund is new, it has gotten 1-star rating from Morningstar for its 2 years positive performance since inception. Currently this VPGFX fund is on the 1st rank in the category. 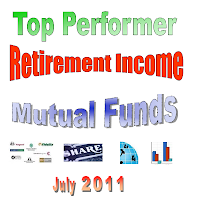 The performance of this top performer fund is 25.90% in year 2009 and 14.43% in year 2010. The YTD return is 7.69%. This fund shares a yield of 3.06%. 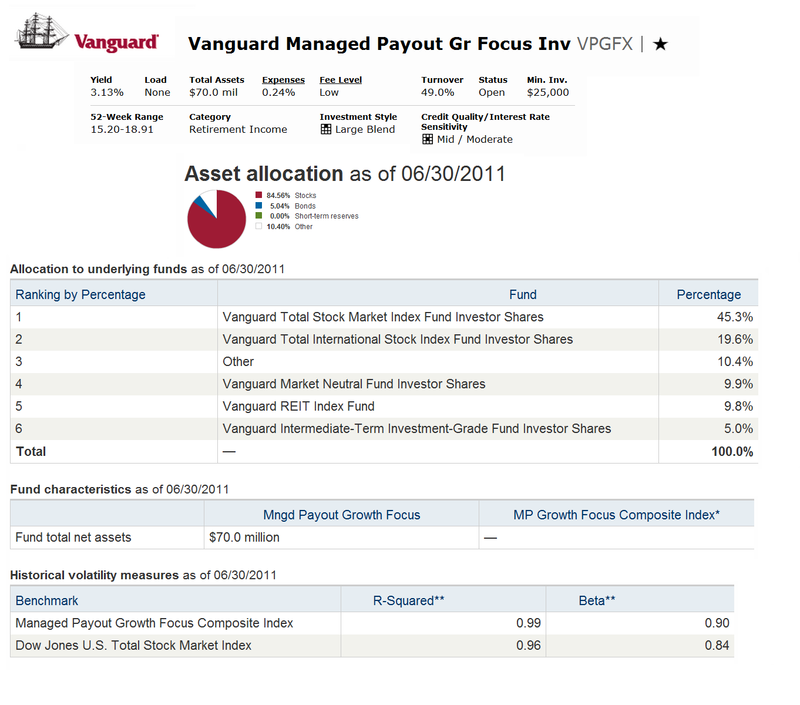 This Vanguard fund is a no load fund. This fund is available for purchase from a limited brokerages list only. The asset allocation of this fund as of June 2011 is Stocks (84.56%), Bonds (5.04%) and Others (10.40%). The top 10 portfolio composition is 45.3% in Vanguard Total Stock Market Index Fund Investor Shares (VTSMX), 19.6% in Vanguard Total International Stock Index Fund Investor Shares (VGTSX), 9.9% in Vanguard Market Neutral Fund Investor Shares (VMNFX), 9.8% in Vanguard REIT Index Fund (VGSIX), 5.0% in Vanguard Intermediate-Term Investment-Grade Fund Investor Shares (VFICX) and 10.4% in Others. 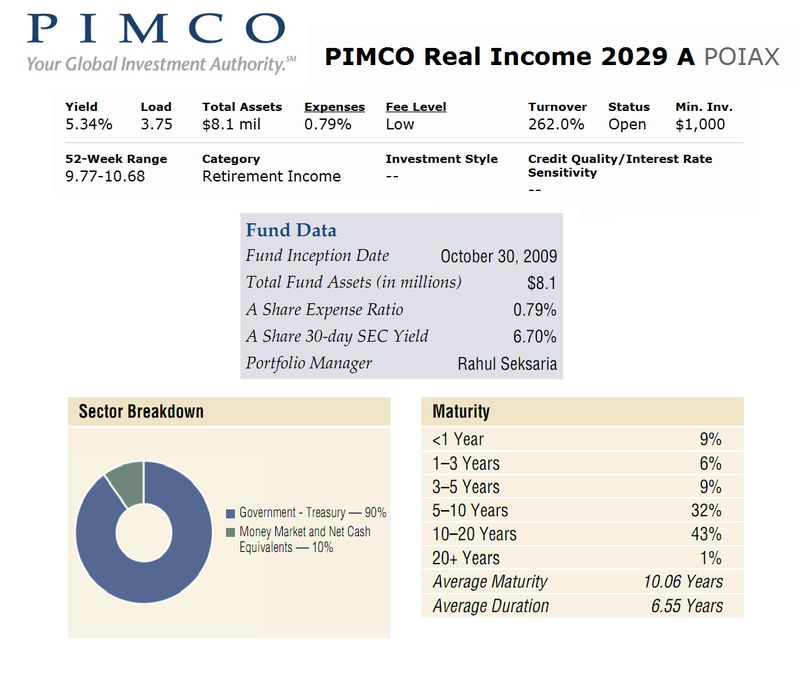 The PIMCO Real Income 2029 fund seeks to provide consistent real (inflation-adjusted) distributions through its maturity date in 2029. 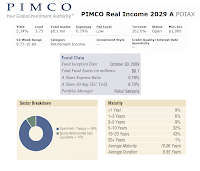 This PIMCO fund invests majority of net assets (>90%) in inflation-indexed bonds issued by the U.S. Treasury. It may invest in other securities issued by the U.S. Treasury, futures contracts on U.S. Treasury securities, and money market instruments. Inflation-indexed bonds are fixed-income securities that are structured to provide protection against inflation. The fund invests in short-, intermediate- and long-term securities in a laddered investment strategy to facilitate regular distributions through its maturity date in 2029. Since this fund is new, it hasn’t gotten any rank from Morningstar yet. But this fund has 7.62% YTD return. This fund has returned 10.78% over the past one year. The performance of this fund in 2010 was 6.99%. The new fund's manager is Rahul M. Seksaria. He is the Senior Vice President of PIMCO and has managed this fund since May 2011. The annual expense ratio of this POIAX fund is 0.79%. Should you are interested to invest in this fund, it can be purchased from a limited selection of 17 brokerages only. The minimum initial investment for brokerage account is $1,000 with $50 minimum subsequent investment. This fund has 0.25% of 12b1 fee and 3.75% of front-end sales load. The last dividend distributed was in June 2011 (0.05%). This fund is available in any other classes, such as Class C (PORCX), Class D (PORDX), Class Institutional (PRIIX) and Class P (PRQCX). As of June 2011, the sector breakdown of this fund is 90% in Government – Treasury and 10% in Money Market and Net Cash Equivalents. This fund has the average maturity of 10.06 years and average duration of 6.55%. The Legg Mason Target Retirement fund is seeking to achieve the highest total return over time consistent with its asset mix. The fund invests in a combination of underlying funds representing a variety of asset classes (equity, fixed income and real estate) and investment styles. This Legg Mason fund typically allocates the assets as follows 30% in equity funds, 65% in fixed-income funds, and 5% in real estate related funds. Steven D. Bleiberg has managed this Legg Mason fund since its inception in August 2008. This retirement income fund shares a dividend yield of 3.10%. The annual expense ratio is 0.45%. The last dividend was distributed in June 2011 (0.03%). As this fund is still new, it hasn’t gotten any Morningstar rating yet. But this fund has a 5.99% YTD return and has returned 14.39% over the past year. Rated number five in this list, the LMPAX fund has 0.25% 12b1 fee and 5.75% front-end sales load fee. The minimum amount needed to invest in the brokerage account of this fund is $1,000 and $250 for IRA account. This top performer fund is currently available for purchase from 28 brokerages like JP Morgan, Scottrade Load, etc. Investor may choose from the other classes of this Legg Mason fund such as Class C (LMRCX), Class FI (LMRPX), Class I (LMIMX), Class IS (LMRSX), Class R1 (LMRFX) or Class R (LMERX). 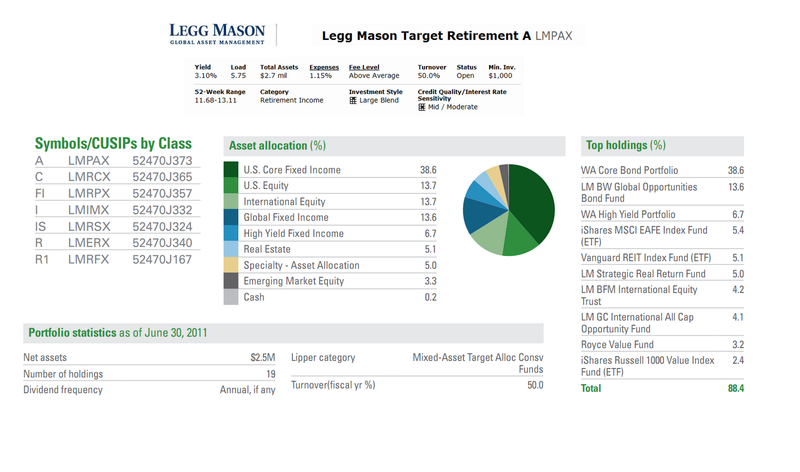 As of June 2011, the top holdings of this LMPAX fund represent 88.4% of total portfolio. They are WA Core Bond Portfolio (38.6%), LM BW Global Opportunities Bond Fund (13.6%), WA High Yield Portfolio (6.7%), iShares MSCI EAFE Index Fund (5.4%), Vanguard REIT Index Fund (5.1%), LM Strategic Real Return Fund (5.0%), LM BFM International Equity Trust (4.2%), LM GC International All Cap Opportunity Fund (4.1%), Royce Value Fund (3.2%) and iShares Russell 1000 Value Index Fund (2.4%). The American Century LIVESTRONG Income fund seeks current income. The fund’s secondary objective is to achieve capital appreciation. As fund of funds, this American Century fund invests in other American Century mutual funds that represent a variety of asset classes and investment styles. 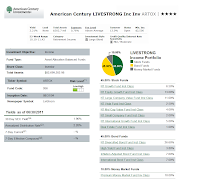 The target asset mix for LIVESTRONG Income Portfolio is expected to remain fixed over time with a 45% allocation to equities (stocks), 45% allocation to fixed income securities (bonds), and 10% allocation to cash. This American Century fund has 4-stars rating from Morningstar for its 5 years achieving positive performance since 2004. This best rated fund has 5.30% YTD return. It distributes a dividend yield of 2.21%. This ARTOX fund has expense ratio of 0.21% every year. This figure is lower compared to the average in the Retirement Income category (0.60%). The fund managers of this fund are Enrique Chang, Scott Wittman, Richard Weiss, Irina Torelli and Scott Wilson. If you are interested to invest in this fund, the minimum amount needed to open a brokerage account is $2,500 with $50 minimum subsequent investment. This fund is not available in IRA account yet. This is a no load fund, meaning there is no 12b1 fee and no sales load fee. The annual holdings turnover rate of this fund is relatively low as well (4.0%). The other classes of this fund are Institutional Class (ATTIX), Class A (ARTAX), Class C (ATTCX) and Class R (ARSRX). Please check with your brokerage account about how to buy this mutual fund. 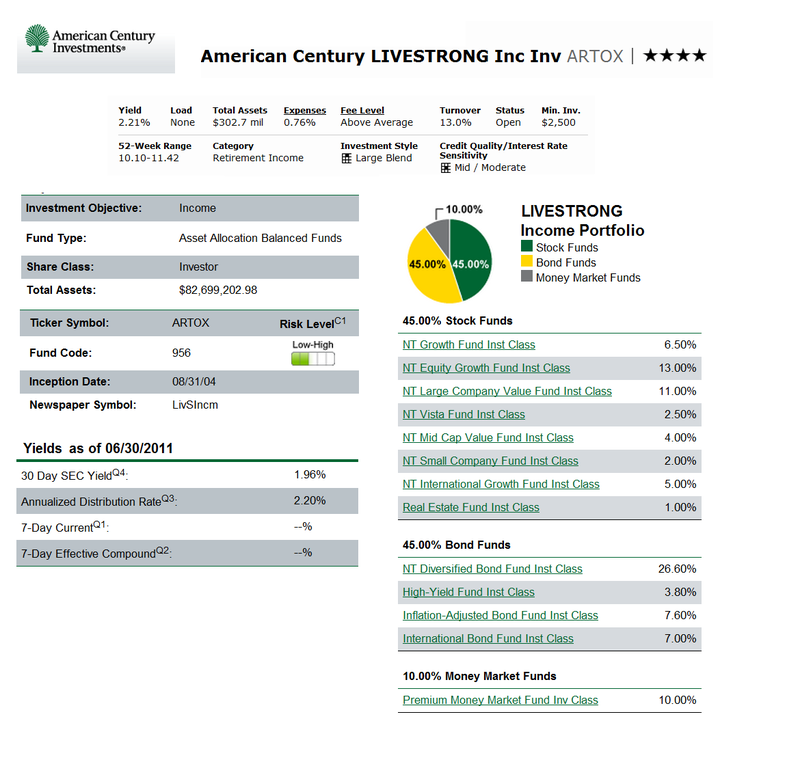 This Livestrong Income fund is a ‘fund of funds’ as it seeks to achieve its goal by investing in other American Century Investments mutual funds. The portfolio of this fund as of December 2010 is 45.0% in Stocks Funds, 45% in Bonds Funds and 10% in Money Market Funds. The Fidelity Income Replacement 2042 fund is seeking total return through a combination of current income and capital growth. The fund typically invests in a combination of underlying Fidelity equity, fixed-income, and short-term funds using an asset allocation strategy designed to achieve a level of total return consistent with a payment strategy to be administered through the fund's horizon date, December 31, 2042. Andrew Dierdorf has managed this fund since June 2009. The yield of this fund is $1.82%. The fund is a no load fund, therefore it applies no management fee and no front end sales load fee as well. To invest in this fund, investor may need $25,000 for the minimum initial investment in brokerage account. This fund can be purchased from 23 brokerages. The CUSIP of this fund is 31617L863. The asset allocation of this fund as of June 2011 are 64.22% in Equity Funds, 32.25% in Bond Funds and 3.53% in MM/Short-Term Fds & Net Other Assets. The top sectors of this fund as of May 2011 are Financial Services (16.15%), Technology (14.25%), Consumer Cyclical (12.26%), Industrials (12.22%) and Energy (11.36%). 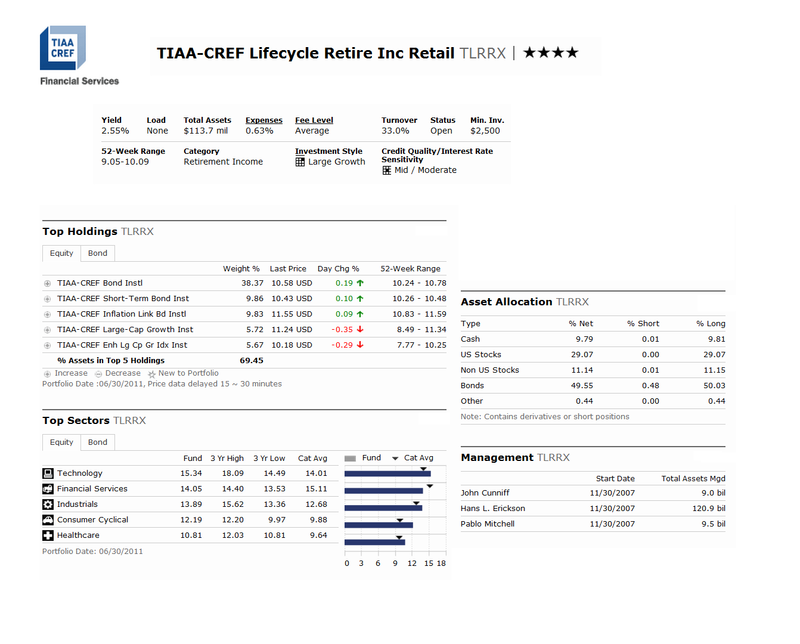 The TIAA-CREF Lifecycle Retire Income fund objective is to seek high total return over time mainly through income, with a secondary emphasis on capital appreciation. The fund invests primarily in underlying funds according to a fixed, more conservative asset allocation strategy designed for investors who are already in or entering retirement. 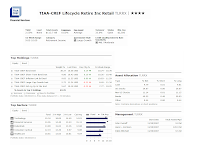 Currently, This TIAA CREF fund invests in a diversified portfolio consisting of about 40% stocks or equities and 60% bonds or fixed incomes. This retirement income fund has been managed by Pablo L. Mitchell since its inception in November 2007. The fund’s net asset is $113.73 million. It has 0.16% annual expense ratio and 5.0% annual turnover rate. This fund has YTD return of 5.19%. Morningstar has rated this fund with 4-star rating. To invest in this top performer and best fund, investor will need a minimum of $2,500 for brokerage account and $2,000 for IRA account. There is a 0.13% of management fee, but no front-end sales load fee. Currently this fund is only available for purchase from a limited of 4 brokerages only. They are Vanguard, Pershing Fund Center, Pershing FundVest NTF and MSSB Mass Mutual. As of March 2011, the target allocation of TLRRX fund is 60.0% in equities and 40.0% in non-equities. And the top 10 holdings of this fund are TIAA-CREF Bond Fund (38.9%), TIAA-CREF Inflation-Linked Bond Fund (10.0%), TIAA-CREF Short-Term Bond Fund (9.9%), TIAA-CREF Large-Cap Growth Fund (5.6%), TIAA-CREF Enhanced Large-Cap Growth Index Fund (5.5%), TIAA-CREF Enhanced Large-Cap Value Index Fund (5.5%), TIAA-CREF Large-Cap Value Fund (5.5%), TIAA-CREF Growth & Income Fund (4.7%), IAA-CREF International Equity Fund (4.0%) and TIAA-CREF Enhanced International Equity Index Fund (4.0%). 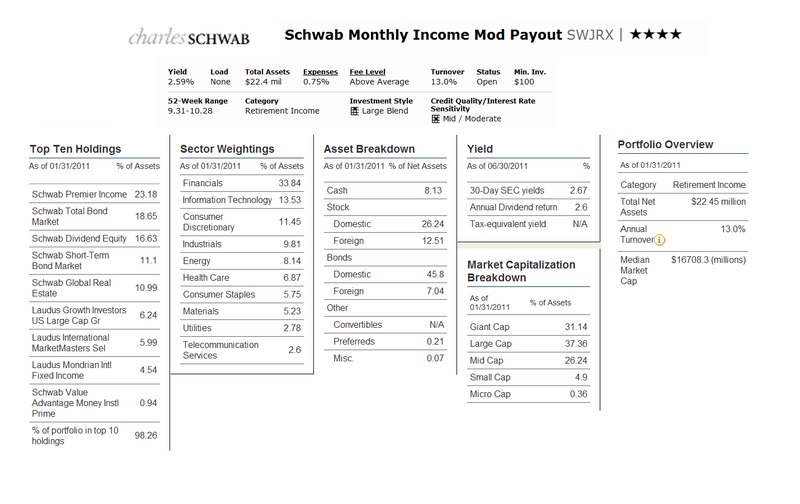 The Schwab Monthly Income Mod Payout fund objective is to provide current income; capital appreciation is a secondary consideration. The fund invests predominantly in a combination of Schwab funds and Laudus funds (the underlying funds) in accordance with its target asset allocation. It may invest <100% of assets directly in cash, money market, repurchase agreements and other short-term obligations. This SWJRX fund has total net asset of $22.45 million. It shares 2.59% dividend yield. The last dividend distributed in July 2011 was 0.02%. This fund is managed by Daniel Kern since October 2008. The expense ratio of this fund is 0.0%. This Schwab fund is also a no load fund, means no management fee and no front-end sales load or deferred sales load. The minimum initial investment needed to open a regular brokerage account is $100. For these past two years after its inception, the annual total return of this Schwab fund was 10.35% in year 2010 and 15.76% in year 2009. Currently it has 5.14% YTD return. This SWJRX fund has gotten 5-stars rating from Morningstar. As of January 2011, the top sectors of this best fund are Financials (33.84%), Information Technology (13.53%), Consumer Discretionary (11.45%), Industrials (9.81%) and Energy (8.14%). The asset breakdown is 45.8% in domestic bonds, 26.24% in domestic stocks, 12.51% in foreign stocks, 8.13% in cash, 7.04% in foreign bonds, 0.21% in preferred and 0.07% in miscellaneous. Note: Some of these funds may be new and don’t have long term performance history.